Chow down on these low cal cheese sticks without guilt. I recently made up a batch to take to a Labor Day lakehouse party. They were snatched in a matter of minutes and I even doubled the batch. Keep in mind these are best served hot from oven with all the oozing, cheezy goodness. 6 double-cheese string cheese (mozzarella/cheese combined). If you can find the “light” kind, that’s even better. Use a blendor, food process (or even a coffee grinder) to grind the Fiber One to a bread crumb consistency. Pour crumbs into a large plastic baggie adding the Italian seasoning, salt/pepper. Cut all string cheese pieces in half. You will end up with 12 sticks. Coat the sticks with the liquid egg and drop into the plastic bag filled with crumbs. You will want to shake off any excess egg batter before rolling in the crumb mixture. Repeat this method of dipping and rolling one more time. You want the cheese sticks throughtly coated. Spray a baking sheet with non-stick cooking spray and arrange cheese sticks on the pan. 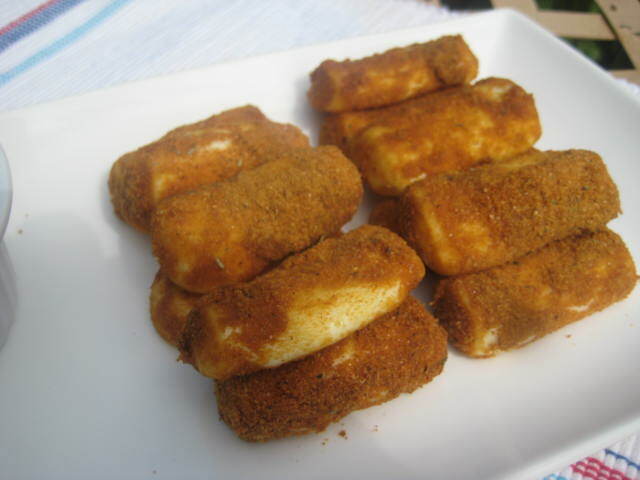 Give the tops of the cheese sticks a light coating of non-stick spray. Bake at 375 degrees for approximately 9-10 minutes. When the cheese starts to ooze out, you know they are done. I like to put the crumb mixture on a plate for rolling the sticks. When using the plastic baggie, the egg mixture starts to clump up and doesn’t’ stick well to the egg batter. A couple of these puppies is in the neighborhood of 150 calories. A perfect complement to the Chicken Crust Pizza.